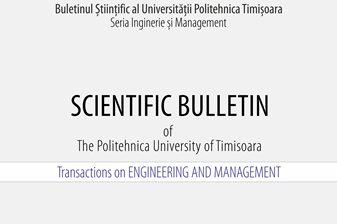 The Scientific Bulletin of Politehnica University of Timisoara, Transaction on Engineering and Management presents research results in the field of industrial management and business studies that are of significant impact on major contemporary issues. The journal welcomes submissions of theoretical, methodological, empirical, policy-oriented, as well as industrial papers in all the field. Additionally, it considers contributions that combine engineering and management studies with any other field of inquiry. The aim of Scientific Bulletin of Politehnica University of Timisoara, Transaction on Engineering and Management is to publish articles related to the fields of engineering and management studies. The journal invites authors of original papers, technical reports or short communications of research results containing new insight to send their papers to the editor. The publication of submitted manuscripts is subject to peer review and both scientific and technical aspects of the submitted paper are reviewed before publication. The journal publishes high quality articles of multi-disciplinary, inter-disciplinary natures and welcomes papers from all disciplines in industrial management and business. Topics (not limited): Management (Entrepreneurship, Strategic Management, Human Resources Management, Operation Management, Production Management, Knowledge Management, Public Management and Governance, Decision theory and Problem Solving, Quality Management, Project Management, Investments Management); Marketing (Strategic Marketing, Customer Relationship Management, Industrial Marketing); Logistics (Supply Chain Management, Transportation); Economic and social sciences (Economics, Accounting, Finance, Socio-Psychology aspects of industrial organizations, Organization Behavior); ICT applications in management and social sciences; Environment Management, Sustainable Development, Green Product or Processes development, Green investments.